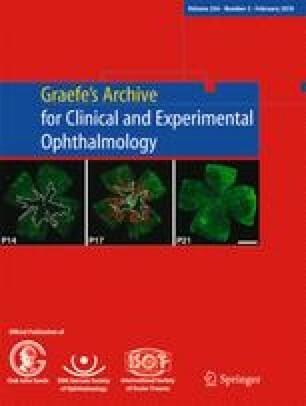 To evaluate the therapeutic outcome for dexamethasone implant (DEX) or intravitreal ranibizumab (IVR) injections over 6 months in patients with macular edema due to branch or central retinal vein occlusion (BRVO, CRVO), in a real-life setting. A total of 107 patients with BRVO or CRVO were included into this retrospective single-center observational study. Patients were treated with monotherapy consisting of DEX or three monthly IVR injections following a pro re nata regimen (PRN). Best-corrected visual acuity (BCVA), central retinal thickness (CRT) and intraocular pressure (IOP) were compared between the two therapy groups after 1, 3 and 6 months. BRVO patients treated with DEX achieved a statistically significant gain in BCVA measured in logMAR after 1 month (mean gain, 95% CI: 0.21, 0.08–0.34, p = 0.001), 3 months (0.16, 0.03–0.28, p = 0.012) and 6 months (0.19, 0.07–0.32, p = 0.002), whereas patients treated with IVR showed a statistically significant BCVA gain in month 3 (mean improvement, 95% CI: 0.13, 0.01–0.26, p = 0.039) and month 6 (0.16, 0.03–0.29, p = 0.018). BCVA in CRVO patients with DEX worsened slightly at month 6 (mean worsening, 95% CI: −0.08, −0.24 to 0.08, p = 0.305), while IVR treated-patients achieved a statistically significant BCVA gain at 3 months (mean improvement, 95% CI: 0.14, 0.02–0.25, p = 0.021). Both therapies were accompanied by statistically significant CRT reductions of 150 to 200 μm (median). Adverse events reported were predictable and limited. In a clinical setting, comparable improvement in BCVA and CRT were observed after DEX and IVR injections for treatment of BRVO. CRVO patients showed greater benefit with IVR. This work was presented in part at the Deutsche Ophthalmologische Gesellschaft (DOG) 2015. Sibylle Winterhalter and Annabelle Eckert contributed equally to this work. We thank Dr. Patricia Buchholz for her advice.